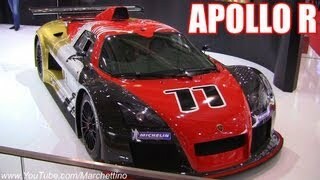 Gumpert of Germany unveiled the Gumpert Apollo R and Apollo Enraged this week at the ongoing Geneva Auto Show. Both these cars are based on the existing Gumpert Apollo model but both made for two completely different segments of customers. Apollo Enraged is the limited edition street legal version of Apollo’s most powerful machine, while the Apollo R is fully fared racing car meant to burn rubber on the tracks. Many have described the cars as ugly, but we think the very beauty of these two massively powerful vehicles lie in their unusual looks. After all, these are basically racing cars and racing cars are generally not meant to look like everyday vehicles. Let’s now get a little deeper and see what the 2012 Apollo R comes with. Here we will only focus on the Apollo R and ignore the Apollo Enraged. For starters, the Apollo R is powered by a heavily modified supercharged V8 engine with a whopping 860 HP, although it is not known yet as to the fuel type at which the car will achieve this maximum output capacity. This high horse power is primarily because of the higher boost pressure, a specially built racing exhaust system, increased flow of air in the repositioned air intakes and a custom ignition and control adjustment. You can only imagine the car’s performance given the fact that it only weighs in at 1100kg. Low weight and high-power will surely make the Apollo R one real beast on the track that its competitor will have to watch out for. The Apollo R comes fitted with all the racing kits that a racing car should have. For instance it has things like bespoke suspension and chassis, enhanced cooling system for engine and transmission, digital tachometer and a racing gearbox. 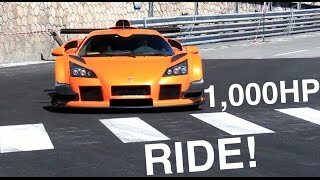 Now everyone is looking forward for the Apollo R to set a new Nurburgring Record ahead of the Pagani Zonda R.
In the past, the sports car manufacturer GUMPERT has mainly been known for building race cars for the street. At the 82nd Geneva International Motor Show, the exclusive manufacturer premieres the GUMPERT apollo r, a purebred race car with the brute thrust of up to 860 hp. 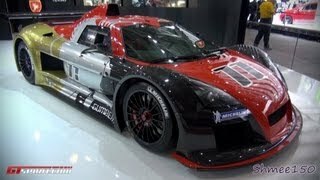 As the second world premiere, GUMPERT presents the special edition GUMPERT apollo enraged. drivers among them to participate in open GT events,” continues the manager of the manufacturing company. transmission is controlled by rocker switches on the steering wheel but without a clutch pedal. A central digital dashboard supplies the driver with essential information. Otherwise all frills were removed from the interior of the apollo r.
To bring all this brute force to the pavement, the chassis which already set standards was extended with a titanium blade stabiliser on the rear axle. Numerous optimisation measures, for example on milled parts, the wiring harness and undercarriage, as well as eliminating comfort components such as the boot, allowed the charge weight (empty tank) to be reduced to 1,100 kg. “The apollo r is more powerful and lighter than any other apollo. Since we are not necessarily known for understatement, we also decided to put this superiority on display with correspondingly striking foils on the apollo r,” is how Roland Gumpert describes his race car. At the exhibition stand in Geneva, the apollo r presents itself in a black-red-gold foil dress. The driver and passenger doors are each graced by a griffin, a cross between an eagle and lion and therefore the lord of the air as well as the earth. seat and headrest, the digital LCD instrument panel is the most noticeable special feature on the interior. will approach this together with its tyre supplier and technology partner Michelin.